Type 'keyword' in the search field then double click in the Keyword.URL	entry in the configuration page. The keyword search from the address bar will be stopped. To enable the feature again, follow the same procedure to change the value to 'true'. 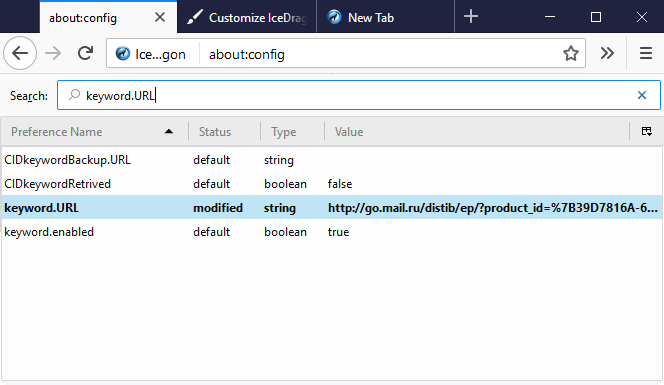 IceDragon shows suggestions from your browsing history and bookmarks when you start typing a URL in the address bar. Click the hamburger/menu button at the top-right corner. Click 'Options' > 'Privacy & Security'. 'Address Bar' - Leave all check boxes enabled to draw suggestions from your browsing history, bookmarks and open tabs. Click 'Options' > 'Search' tab. Select / deselect the check 'Provide search suggestions' box to enable / disable search suggestions. 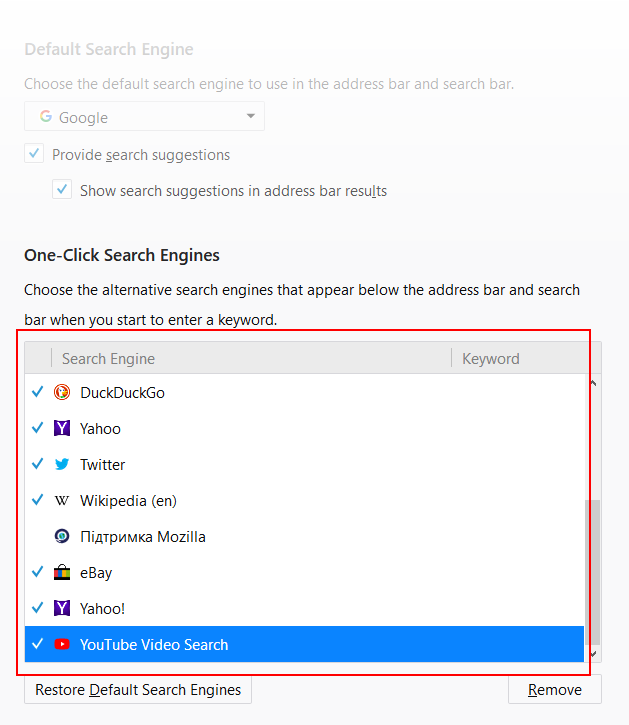 Enable 'Show suggestion in location bar results' to show suggestions when you search from the IceDragon address bar. 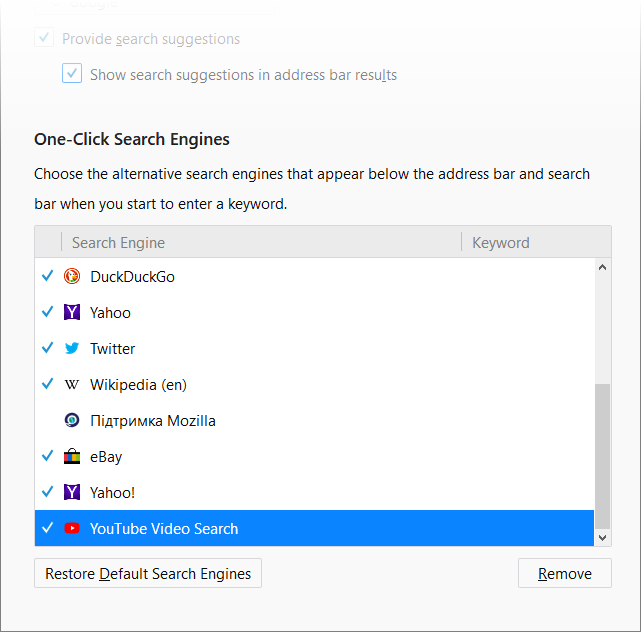 Show search suggestions ahead of browsing history...' - Enable if you wish to see suggestions from your search engine first, and suggestions from previous pages that you have visited second. And in your 'Default Search Engine' list. 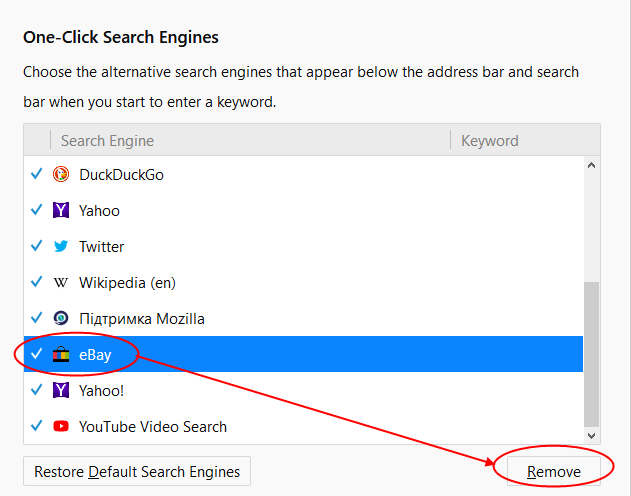 Click 'Restore Default Search Engines' to add a default search engine back to the list.